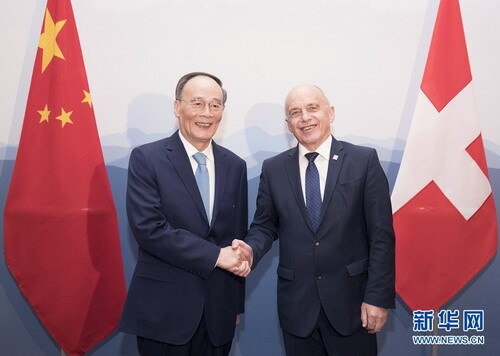 ZURICH, Switzerland, Jan. 22, Chinese Vice President Wang Qishan said here Monday that China stands ready to work with Switzerland to further promote bilateral ties and cooperation, particularly in the field of innovation. Wang, who is paying a visit to the European country on Monday and Tuesday, made the remarks in his talks with President Ueli Maurer of the Swiss Confederation and at a business dialogue on innovation attended by both leaders. The China-Switzerland relationship has been developing rapidly over recent years and has now reached its best level in history under the guidance of both countries' leaders, Wang said during the talks. He noted that economic and trade cooperation between the two countries has kept deepening, political mutual trust has increased markedly, and bilateral friendship is gaining ever more public support. Switzerland, he added, is one of the first Western countries to recognize and establish diplomatic relations with the People's Republic of China, has taken the lead in multiple areas of cooperation between China and European countries, and has played an exemplary role in promoting China-Europe cooperation. Despite their differences in size, stage of development and genes of civilization, the two countries respect each other's development path and have always treated each other equally and pursued friendly cooperation, Wang said, adding that the 2016 establishment of the China-Switzerland innovative strategic partnership has charted the course for the future development of bilateral ties. The two sides, said Wang, are highly complementary in such areas as economy, trade, finance, manufacturing, medicine and health care, where they can carry out win-win cooperation. Calling the China-Switzerland free trade agreement an example of success in bilateral cooperation, Wang said China is ready to work with Switzerland to speed up the joint study on upgrading the deal, so as to infuse stronger impetus into their economic and trade cooperation. Meanwhile, the continuous opening-up of China's financial sector has created new opportunities for bilateral financial cooperation, he said, adding that Beijing encourages Chinese financial organizations to operate in Switzerland and invites Swiss ones to expand their business in China. He suggested that the two countries explore cooperation in such areas as smart manufacturing, digitization and new energy, so as to enrich the China-Switzerland high-level innovation cooperation platform devised by their leaders. China and Switzerland, he added, should also step up people-to-people exchanges and tourism cooperation, so that they can further consolidate the public support for bilateral relations. The vice president also expressed the hope that the two countries will carry out active consultations on an inter-governmental cooperation agreement within the framework of the Belt and Road Initiative and achieve positive results at an early date. Addressing the business dialogue on innovation, Wang noted that Switzerland is one of the most innovative countries in the world, and that China also attaches great importance to innovation. To build China into an innovative country, Wang said, Beijing is committed to pursuing innovation-driven development, promoting the rule of law, improving market order and strengthening protection of intellectual property rights. Noting that the pioneering spirit is the most prominent feature of China-Switzerland relations, Wang said the business dialogue on innovation is a concrete measure to implement the consensus reached in 2017 by the two countries' leaders on establishing the China-Switzerland high-level innovation cooperation platform. China and Switzerland, Wang said, should stick to openness and inclusiveness and join hands to promote the building of a high-level open world economy. The two sides should cement mutual understanding and trust, he said, adding that they should understand both the present and the history of each other, so as to jointly plan for the future. The two sides should boost confidence and maintain patience, he said, stressing that China will open wider to the outside world and, with its market of 1.4 billion people promising enormous possibilities, stands ready to share development opportunities with other countries. The two sides should seize opportunities and bravely promote reform, he said, urging Chinese and Swiss enterprises to share innovation outcomes and make concerted efforts to forge global industrial, innovation and value chains. The two sides should also improve business environment and guide bilateral cooperation, Wang said, calling on the two countries' governments to establish reasonable and efficient institutions and provide strong policy support for corporate operations. For his part, Maurer said his country and China have maintained a long-running friendly relationship, with frequent high-level mutual visits and ever deepening political mutual trust. China has made admirable achievements in national development, said the president, adding that Switzerland respects China's history, culture, development path and institutions, and adheres to the one-China policy. Noting that the Belt and Road Initiative is conducive to promoting cross-border trade and investment, the Swiss leader said he looks forward to leading a delegation to China later this year for the second Belt and Road Forum for International Cooperation. Switzerland, Maurer added, is willing to work with China to accelerate the joint study on upgrading the two countries' free trade deal, and boost bilateral cooperation in such areas as trade, finance, technology, medicine, digital economy, people-to-people exchanges, education and tourism, so as to create more mutual benefits. The visit is the first leg of Wang's trip to Switzerland, which will also take the Chinese vice president to the snow-capped Alpine town of Davos for the 2019 annual meeting of the World Economic Forum.